Born into an extraordinarily artistic family, Arthur Boyd is considered one of Australia’s greatest painters of the 20th century. 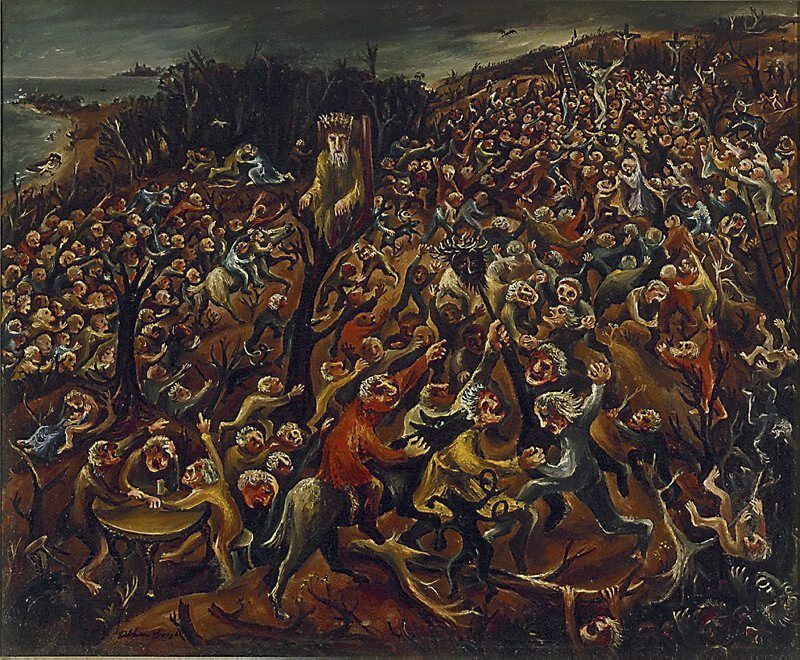 In the 1940s, he produced a series of paintings which tackled overtly biblical themes, set predominantly within the Victorian landscape near the Boyd family property at Murrumbeena, close to Port Phillip Bay. 'The mockers' is one of a series of about 15 paintings executed between 1945 and 1948 after Boyd’s discharge from the army. Responding to the horrors of the Nazi concentration camps, witnessed through newsreel footage, Boyd drew on his knowledge of the allegories of Pieter Breugel the Elder and Hieronymus Bosch, in an attempt to find a personal answer to the moral chaos and social disorder he observed. Signed l.l., black oil "Arthur Boyd". Not dated.